<< Back Vans. WARD. SUEDE-CANVAS. BLACK. Sizes: 13. 14. 15. Old Skool retro collection. A lightweight Suede and canvas Combi Lace-up shoe, the Vans Ward features heel cushioning for extra comfort. re-enforced toecaps for durability, and padded collars for support and flexibility. Signature rubber waffle outsoles give this shoe a firmer grip. 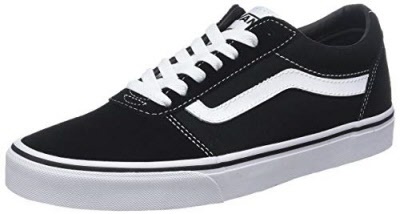 Classic lines with the signature vans logo on tongue and heel. Combination of Textile and canvas uppers. The In trend shoe at the moment, looks great worn with Jeans.